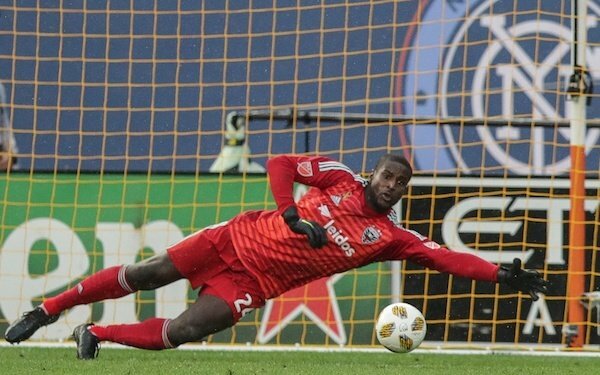 Goalkeeper Bill Hamid came back from Denmark in mid-season and helped D.C. United make the 2018 MLS playoffs with a 9-2-3 record in 14 games and a 1.00 goals-against average, the lowest in his nine seasons, even better than in 2014 when he was named the Goalkeeper of the Year. At 28, Hamid is approaching the prime of his career, so it was a surprise that he wasn't called into the U.S. men's national team's January camp by new head coach Gregg Berhalter, who selected Alex Bono (Toronto FC), Sean Johnson (NYCFC), Tyler Miller (LAFC) and Zack Steffen (Columbus). Other worthy candidates also weren't picked, including Tim Melia (Sporting Kansas City), Stefan Frei (Seattle) and Luis Robles (New York Red Bulls), not to mention Brad Guzan, who was rested by Berhalter after Atlanta United's MLS Cup championship run, and Ethan Horvath, who is starting for Club Brugge in Belgium. Hamid believes he should be in Chula Vista, where the USA in starting its third week of training. Hamid says he spoke with Berhalter before camp. Hamid's return from FC Midtjylland of the Danish Superliga on an 18-month loan was influenced by his need to be playing again if he wanted to remain in the national team picture. Hamid understands an opportunity to play for the national team is not a given. “You have to earn it," he said. "You have to earn it every week. I’m 28 now and I’ve been playing in MLS since I was 18 years old. It’s been 10 years. It’s been a great 10 years of my life. It’s a lot of growth as a goalkeeper and I’m starting to feel like it’s all coming together. So now, once the games start, I just have to keep grinding away and performing well. I know that I’m going to show this country and show the world that I’m the best goalkeeper in the United States of America, like I once did." Berhalter is the fourth U.S. coach in the last 26 months. "That's football," Hamid said. "It's a revolving door. I know what Gregg is about and the style of football he wants to play. I just have to impress him. I know he's watching. He says he's going to be watching me. I understand what he expects out of his goalkeepers in terms of playing out of the back, in terms of distribution, in terms of shot-stopping. I completely understand." He spent part of the offseason seeking out advice on his game. "I analyzed my game a lot more," Hamid said. "I went to London and spoke to some people and sat down with them and analyzed my game. I actually know some Premier League coaches that I sat down with and they analyzed parts of my game that I didn't realize were deficiencies. And I didn't really get that information from past goalkeeper coaches or the goalkeeper coach I have now. To get a different sense, a different understanding was great for me. I am 28 now and learning the craft. Fine details are the most important thing for me." Now, it's back to work at D.C. United, which is seeking to return to MLS Cup for the first time since 2004. Hamid said the team met with the owners for dinner last week. "They have invested in the team, in players, in the stadium," he said. "We've been told the goal." 2 comments about "Bill Hamid believes he is better than four keepers in USMNT camp". R2 Dad, January 21, 2019 at 6:14 p.m.
Hmmm. When trying to break in to the USMNT, it's almost never advisable to "keep it real". I have no idea if his claims are valid, since I haven't really studied our keeper situation in a while. If I were to speak so freely, I would certainly come armed with stats, rather than discuss how you feel about it. Good luck, BH--we need players like you who come ready to perform to secure their USMNT playing time. And remember; it's not just how you perform--it's also about how well you get your back line to perform with you between the sticks. R2 Dad replied, January 22, 2019 at 2:54 p.m. Watched the interview. Sounds like he has a good understanding of the situation, is in the mix but just not at GB's first camp. We need some dominant play from him one of our keepers if we are to settle on a new #1. He should get at least another crack at it in the March camp.